Europe is preparing to impose tariffs on Harley-Davidson (HOG) motorbikes, bourbon whiskey and Levi's jeans in retaliation for President Donald Trump's planned taxes on steel and aluminum imports. European Commission President Jean-Claude Juncker identified the products as targets for "counter measures" the European Union has been preparing, a Commission spokesperson told CNN. The EU said earlier its response would be swift, firm and proportional. Harley-Davidson declined to comment on the European Commission's decision Friday, but Levi issued is a statement voicing support for free trade. "We support open markets and free trade where everyone plays by the rules; these measures will not only hurt American brands and workers but also have reverberations across the global economy," a company spokesperson said. The justification for the tariffs - national security concerns -- also drew harsh criticism. German Foreign Minister Sigmar Gabriel described the administration's reasoning as "incomprehensible." "The EU must respond decisively to US punitive tariffs, which endangers thousands of jobs in Europe. There should be no doubt about that in Washington," Gabriel said. Alexander Winterstein, a spokesman for the European Commission, told reporters the 28 countries of the EU would respond to the tariffs as a single bloc. The Commission will discuss its response next Wednesday. The EU could also introduce "safeguard measures" if it suddenly sees a surge in steel imports. These measures could include tariffs or import quotas and can be enacted quickly, Winterstein said. Another obvious move would be to file a complaint against the US with the World Trade Organization. Analysts at UBS said Europe would have a good chance of winning, but that could take 18 months. "If the EU wins, it could impose more economic sanctions on the US," said Peter Holmes, a trade expert at the University of Sussex. The WTO ruled against the US when the Bush administration introduced steel tariffs in 2002. The US then lifted those tariffs, under threat of sanctions on oranges from Florida and textiles from North Carolina. US trading partners are worried about how Trump's new taxes will affect demand for their steel and aluminum exports. They're also concerned that steel that may have gone to the US will instead flood into their markets. Some key US trading partners may be made exempt from the tariffs — but it's not clear which countries, if any, will be spared. Affected countries aren't likely to take a big economic hit lying down. 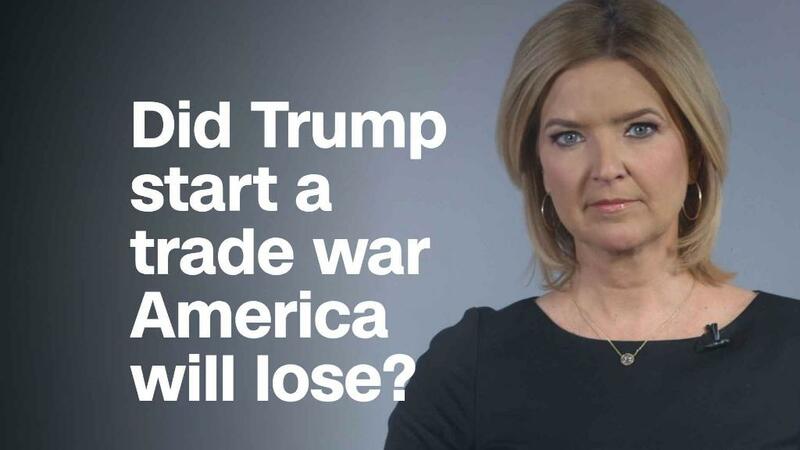 "This is the opening salvo in a trade war. The countries we deal with are not going to sit there and take this," said Phil Levy, a senior fellow at the Chicago Council on Global Affairs. Analysts say that China's response will be especially important. Beijing could retaliate by imposing punishing measures of its own on major US exports such as soybeans or airplanes. Or it could put the squeeze on top American companies that do big business in China, such as Apple (AAPL) and Intel (INTC). Trump will implement the tariffs under Section 232 of the Trade Expansion Act. To do that, he must claim that steel and aluminum imports hurt the country's national security. Critics say that justification is a stretch, and makes a mockery of international trade rules. "It is entirely inappropriate to view any trade with Canada as a national security threat to the United States," Canadian Foreign Minister Chrystia Freeland said in a statement. Other US allies including South Korea and Australia also issued statements criticizing the tariffs. The Trump administration has been considering tariffs on metals for months, giving other countries time to prepare their responses. The EU is the second largest producer of steel in the world after China. 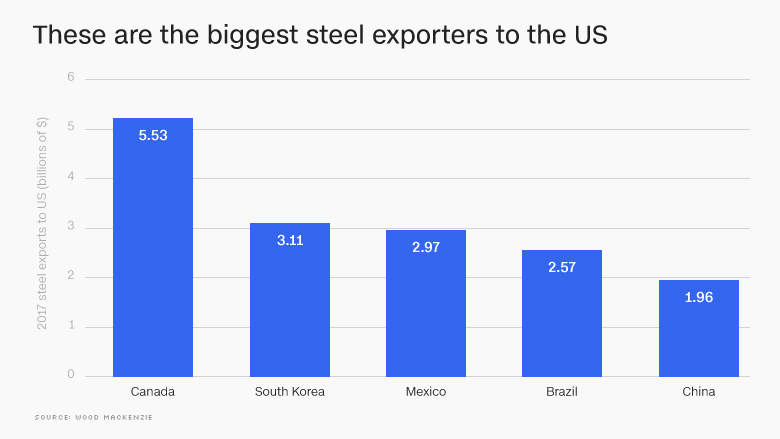 The bloc produces around 170 million metric tonnes of steel a year, accounting for 10% of global output, according to the World Steel Association. -- CNN's Alanna Petroff and Nadine Schmidt contributed reporting.